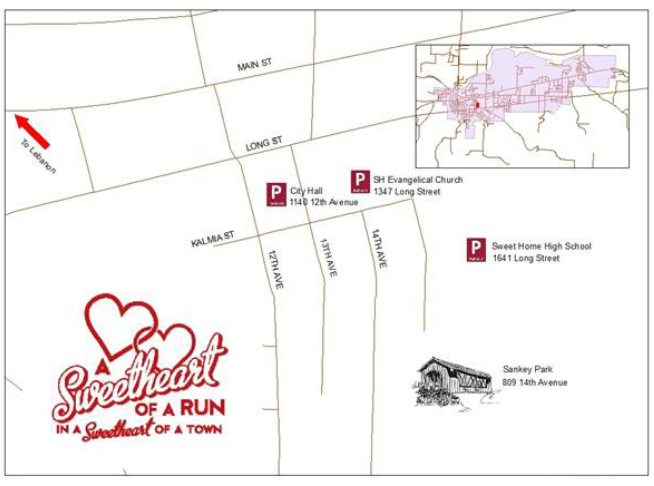 On Saturday, February 9th, 2019 the City of Sweet Home Parks and Recreation Department is proud to present the 4th Annual Sweet Home's Sweetheart Run. There will be a FREE 1 mile Kids Fun Run for children 10 and under, so the whole family can participate! Kids will receive their own bib, finisher's medal, and best of all, a surprise goodie bag! The kids 1 mile run will start promptly at 10:00 AM. The 5K and 10K race will immediately follow the kids run. Shirts available for an additional $10 through 1/31/19. Want to escape the lines? Come to pre-race packet pickup. Can I pick up my entire team's packets and/or friends' packets? YES! We encourage each participant to collect packets for either their entire team or for a friend. It'll make race day much easier if you've already collected your packets and shirts! Race results will be posted on the Eclectic Edge Racing website at www.eclecticedgeracing.com a few days following the race. There are many volunteer opportunities available! Volunteers are needed to help with parking and logistics, registration, water and first aid stations, post-race festivities, and more. Here is some information that should be helpful to you before race day. Aid Stations - Sweet Home Fire and Ambulance will be on site. Water and restrooms will be located at the start/finish. Water and first aid supplies will also be located along course route. Awards - We will have a special medal for every finisher of the Sweetheart Run! We also have beautiful medals for the top three finishers in each age group for both the 5K and the 10K. Special crowns and tiaras will be given to the overall winners. Bag Check -There will be a place to store your belongings while you are running/walking the event. You will need your race bib number to drop off and pick up your items. We cannot guarantee items dropped along the race course will be returned. Dogs - For the safety of all participants, dogs are not allowed on the race course. We ask that you leave pets at home. Friends & Family - Have a group cheering you on? Everyone is welcome; we have lots of room for spectators! Goodie-Bags - Each participant will receive a goodie-bag full of great items! Photos - We have a professional course photographer and a still photographer onsite who will be taking group photos during the event. Prizes - We have some amazing prizes to give away from our sponsors. Please check the award tent before leaving to see if you have won a prize. Prizes must be picked up in person before the end of the event. Results - A results link will be posted following the race at Sweet Home's Sweetheart website following the race. T-Shirts - There will be a limited number of shirts available at the event for $10. Volunteers - Volunteers please check in at the t-shirt table at 8:30am to receive your instructions and orange safety vest. Warming Tent - There will be heaters on Sankey Bridge before and after the race . what not to bring...our four legged canine friends. Unfortunately, the insurance we use for the Sweetheart Run does not allow for dogs to participate in the run. However, leashed dogs are welcome to come and spectate! All Sweetheart Run participants will receive a finisher medal. 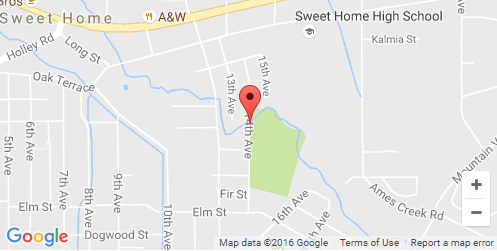 Sweet Home's Sweetheart Run will start and end at the historic Weddle Bridge at Sankey Park (809 14th Ave., Sweet Home, OR 97386). Parking is available at City Hall (1140 12th Ave.), Sweet Home Evangelical Church (1347 Long Street), and Sweet Home High School (1641 Long Street). Parking for the disable is located at Sankey Park (877 14th Ave.). Please note that 14th Avenue is closed to through traffic during the race for the safety of our participates. Due to the upfront nature of event costs, we have a uniform policy of no refunds, transfers or deferrals to a future year. We know that plans change and unexpected things come up, but we feel it is most fair to apply a uniform policy to all, instead of an arbitrary line of who merits a refund and who doesn't. Thank you for your understanding. When this page loaded, the official time was 9:04:43 PM EDT.